A biographical drama comedy set in the world of figure skating, I, Tonya delves beneath the headlines to round out the Tonya Harding story. Born into a broken white trash home in Portland, Oregon, Harding (Margot Robbie) was raised by her abusive mother LaVona (Allison Janney). 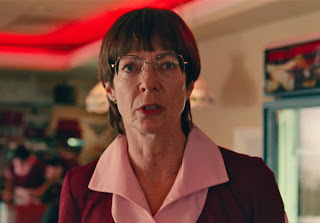 Incredibly talented as a figure skater, Tonya quickly establishes herself as a rising star under the guidance of her coach Diane (Julianne Nicholson), but never fits into the sport's wholesome image. At 19 years old she escapes her mother's house by marrying Jeff Gillooly (Sebastian Stan), who comes from an equally poor background. Their relationship is passionate but turbulent and Jeff is quick to resort to physical abuse. Tonya anyway rises through the ranks and makes headlines by becoming the first woman to land a triple axel. She leaves Jeff but returns to him as the Olympic games beckon, but more troublesome is Jeff's friend Shawn (Paul Walter Hauser), a delusional slob who stokes violent schemes, with Tonya's rival Nancy Kerrigan as a potential target. Written by Steven Rogers and directed by Craig Gillespie, I, Tonya is based on separate prolonged interviews with Harding and Gillooly in which they apparently provided wildly differing accounts about their relationship and the assault on Kerrigan. As such, Gillespie adopts a lighthearted touch to the most controversial chapter in competitive figure skating history. I, Tonya includes the main actors in pretend interviews speaking directly to the camera, plus Robbie intermittently breaking the fourth wall mid-scene to offer commentary snippets to the audience. The film's attitude and style perfectly suit the unfortunately sordid subject matter. Harding overcoming her upbringing to gatecrash the community of princess performers contains material for an inspirational if standard drama. Her association with Gillooly and by extension Shawn takes the story to another place entirely, where the roots of her upbringing latch on to her success and conspire to bring her down from the top of the world. The film takes on Harding's personality: unapologetic, robust, funny, and dogged in pursuit of a story that would have been outlandish as fiction. I, Tonya easily achieves its prime objective of filling in the gaps behind the headlines. Harding emerges as a product of her environment, her achievements and faults placed into perspective. Her attachment to Gillooly is placed into the context of her upbringing, and her tenacious pursuit of love and adulation is as much about emotional survival as achievement. Some parts of the film are less effective. The fake interview sessions with Hard Copy reporter Martin Maddox (Bobby Cannavale) add little to the narrative. And once the story arrives at the immediate aftermath of the Kerrigan assault, Gillespie tries to do too much in the run up to the Lillehammer Olympics. Harding's world may have gone crazy in those few weeks, but as a film too much is thrown at the screen and focus is lost. I, Tonya features two exceptional performances. Margot Robbie (who also co-produced) is sensational as Harding and delivers a multi-faceted performance ranging from victim to champion, never losing touch with Harding's humanity. And Allison Janney is chilling as she brings to life a mother hardened by poverty and misfortune. LaVona's version of motherhood is vulgar warfare against whoever stands in the way of her daughter's success, including Tonya herself. Vivid, rancorous and stylish, I, Tonya scores well on both technical merit and presentation.